When money is short and ingredients in your kitchen will be slim, check out these meal ideas. 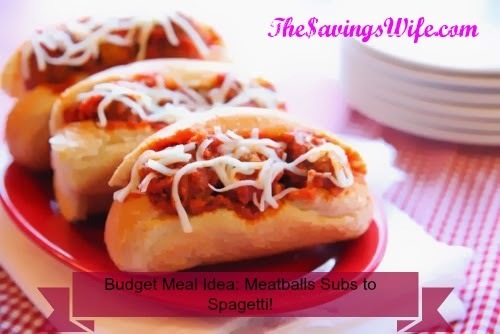 This weeks Meal Idea is Meatball subs and Spaghetti and Meatballs. Each of these Budget Meal Ideas feeds the next meal, so these are great to fill your Meal Plan with. Need a meal plan and budget? Spaghetti or favorite long pasta. Cook spaghetti according to package, then mix in leftover meat and sauce. Spaghetti is one of those things that tastes better the older it gets. So I would suggest that you put leftovers in freeze-able 1 serving containers and use for lunches or dinners on those days you just want to cook. Just reheat in microwave. They are much cheaper and healthier than the high salt frozen meals.